How good are you at designing and development? You’re pretty good? That’s great, but you know what, you need more than just design and development skills to succeed in this business. You need to be able to behave like professional businesses if you want to get paid good bucks. This is essential if you are a freelancer you have your own design studio. One of the basic things that freelancers in general, and web designers in specific, forget about is professional looking business documents. And the most important business document is without a doubt the invoice, i.e. the paper that gets you paid. We have shared tips for drafting business invoices and we have also shared a collection of free invoice tools but it seems you guys want an easier solution. So today we are bringing you free invoice templates. So today we are sharing a collection of free templates for Microsoft Word. All these Word invoice templates were crafted by generous people on the internet, and we have compiled them into an all-in-one download file. But of course, we are not taking anything away from the original creators and you can download or visit the source pages of each of these templates. Before we move on, here’s a little tutorial for understanding how these templates work. How you can add these templates to your Microsoft Word. Mind you, we did not make this tutorial so all the views represented in this tutorial are of the tutorial creator, not ours. One more thing, in this tutorial you only learned the method of downloading templates from Microsoft.com but we have downloaded these templates from various sources. Second invoice template that we have selected is called Vegas. Just like the city, this template is full bling bling. At InvoiceHome, you can find the cleanest and most minimal of designs to the most sparkly ones. They got premium and free templates and they’re both ready to be printed or emailed. But you know, InvoiceHome is not the only template provider out there, so let’s check out some others as well. This invoice template is in .doc format, you can open and edit it just like any other Word File. This is another one of of the simple, but professional looking templates. This is one of my favorites in this list. This invoice template was designed specifically for freelance graphic designers in mind. 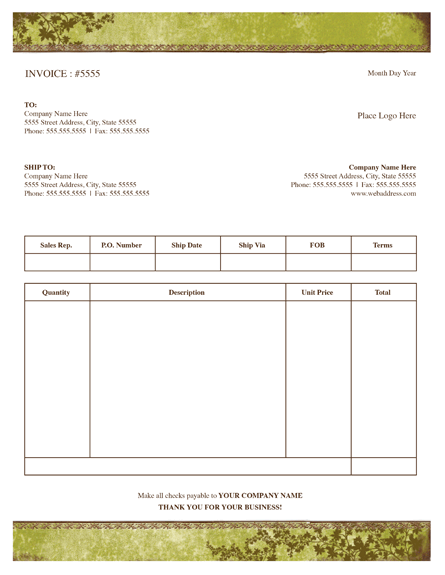 This is also a simple, straightforward invoice template that can be edited easily. To be honest, this is not my favorite in the list, but since it was one of the easiest to edit, I’m placing it up in the order. Sometimes, invoice need more details than product name and its price. This is an invoice template for such occasions. These are simple designs but the layouts are absolutely professional. You can add your own logo, colors, fonts and other branding elements to and you’re good to go. This is a true invoice template Word formatted of professional grade. It also includes a thank you message and payment confirmation system. If you’re looking for a convenient, no-frills way to generate invoices, this template may be just what you need. It prompts for client information, includes a table for listing charges, and calculates taxes (according to US treasury department) and totals for you. This is a classy looking invoice template. Be aware that this design will eat lots of printer ink, so if you are sending physical invoices, this template may not be the ideal choice. This is another one of the detailed templates that make the difficult task of creating lengthy invoices, easy. This is not the most professional looking design, but sometimes your business demands a little goofy design… and in such situations, this fits perfectly well. Be assured, even though the design is a little goofy, it contains all the professional elements of an invoice. Due to legal issues, these templates are not being provided in the all-in-one download file. So you’ll have to download them individually, just the way Microsoft likes it. However, you do get the 15 templates mentioned above in the all-in-one-download file. Use this sales invoice template to calculate line item totals, discounts, sales tax and the invoice total. It includes alternating white and green table rows. Use this standard invoice to bill for sales or services. Works with themes and can be personalized by adding your company logo. Easily customize this template and the others in the set by using built-in Word colors and themes, adding your own logo and business information. Use this sales invoice template to calculate line item totals, discounts, sales tax and the invoice total. This invoice can be used to bill clients for services or product sales. This is quite an elegant design. If the colors match your business’s theme colors, this should be a good choice. This template is designed by none other than HP (not Harry Potter, but Hewlett-Packard). This template uses traditional black and white colors of the court, law and judiciary. So it contains a certain legal feeling. This is another one designed by HP. Thanks to them, I’ve learned a new word (eclectic). The title says almost everything, if you still have any confusion, just take a look at the screenshot. I love the footer of this template. I’m not sure if it is an ideal template for web designers, but it does suit certain professions. Now this is an ideal invoice template for web designers and graphic designers. HP named this template “legal chic”. I have nothing to add here. This template comes built-in in the latest version of Microsoft Word, but in case you don’t have it, you can download it for free. Alright folks, that’s it for now. Thanks for staying with us. Oh, and before I forget, we’ll be publishing a collection of Excel based invoices very soon. So stay tuned. You can stay updated with our posts via Twitter and Facebook. We’d love to see talk to you on our social media accounts.